If you are noticing white spots on your silverware and plumbing fixtures, brown stains on your sink or bathtub, or your appliances that use water break down more often than they should, Aquareal’s Kinetico water softeners are exactly what you need. Hard water is water that contains more minerals than normal, especially calcium and magnesium. It can also have iron minerals, easily justified by the brownish color of the limescale that is usually white. The more of these minerals are present in the water, the higher its degree of hardness will be. Because the magnesium and calcium ions are positively charged, other positively charged ions are much harder to dissolve in hard water. This explains why soap doesn’t dissolve easily in this kind of liquid and does not lather well either. 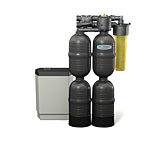 Water softening is a process through which the iron, calcium and magnesium ions, present in hard water, are replaced with a more preferable ion, like sodium, with the help of a water softener unit which is connected to the water supply. With this device in your house, you will not have to worry anymore about scale build up inside of your pipes, washing machine or dishwasher. The replacement of ions takes place inside the water softener’s tank, which is full of minuscule polystyrene pellets, usually called resin. When the water moves past the resin, the bonded sodium switches places with the magnesium and calcium ions. After several cycles, the sodium ions will be depleted and will need to be regenerated by adding sodium salt in the ion exchanger tank. The switch will take place again, and the hardness minerals will be flushed away through a drain pipe. Aquareal’s most important goal is to upgrade the quality of the water you use which, in turn, will improve the level of your health. A Kinetico water softener uses no electricity, only kinetic energy from your water, making it the most efficient method available, also the cheapest in the long run. To see how a water softener can improve your life, give us a call today at (416) 221-1107. Check full list of our Kinetico Water Softener products.